Basically Garos are one of the immigrant tribes in Tripura. Their original home land was at Meghalaya (Garo Hills), Kamrup, Goalpara etc. places of Assam and Mymansing of Bangladesh. Migration of this tribe took place during the 1 st half of 19 th century. Their major migration took place after 1950. As per 2011 Census their population is 12,952 in Tripura. Their major concentration are at Udaipur Sub-Division and Sadar Sub-Division of Tripura. Ethnically Garos are a tribe of Tibeto-Burman linguistic family under Mongoloid racial stock. 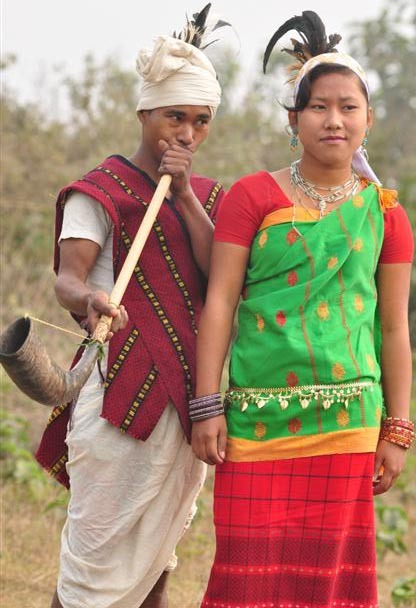 They are very much familiar with the tribes like Bodo-Cacharies, Ravas, Karbi and other North-East tribes. Wangala festival of the Garos has great importance in their life. When new crop is harvested the whole community celebrates this Wangala Festival with colourful dance, songs and music. The long hand drum and other traditional musical instruments of Garos are really praiseworthy and tune of these instruments are so melodious that these create an eternal feeling in mind. Garos have their traditional social council. The village chief is empowered to look after the social taboos and customs. He settles all sorts of social disputes among the community members.